Modern Windermere lake front masterpiece. Designed by one of Orlando's top interior design firms. 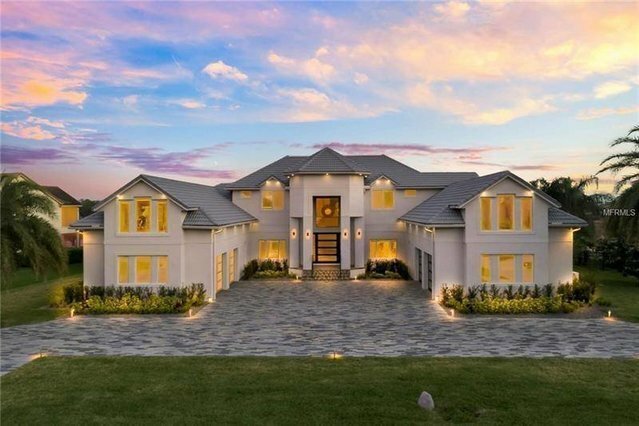 This stunning estate underwent a ground up renovation in 2018 and features over 8,000 sg. Ft. of unparalleled contemporary craftmanship. As you step through the front doors your immediately greeted by a bright open floor plan with a soaring two-story foyer and a grand staircase with custom glass railings, all framed by striking lake vistas from every window. The gourmet kitchen includes fine European inspired custom cabinetry, top of the line appliances, a large walk in pantry, and a massive center island with seating for 6. The master wing features a spectacular spa bath, separate lounge area, and a one of a kind custom closet. Additional features include 6 bedrooms, 7 full baths, 2 half baths, a game room, a gym, a sauna, a state of the art home theater, and top of the line technology throughout the home. Exterior amenities include an infinity edge pool wrapped in glistening imported glass tile overlooking a 1.3 acre lot on Lake Davis with a private boat dock featuring a 2nd story sun deck. Tildens Grove is soon to be guard gated and is located just minutes from world class shopping, fine dining, downtown Windermere, and all of the area theme parks. Don't miss your opportunity to own this exquisite residence. Listing Source: MFRMLS | Last Refreshed Date Time: Apr 23 2019 5:05PM.